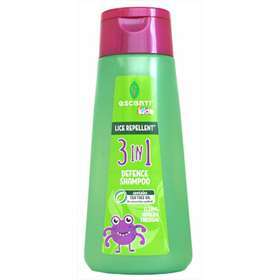 Escenti Tea Tree Childrens Head Lice Repellent Detangling Shampoo. Escenti Head Lice Repellent Shampoo is specially formulated to keep hair clean and refreshed. It contains pure tea tree oil to help protect your hair against head lice infestation and a special anti-tangling ingredient to help make hair easier to comb. Apply generously to wet hair, lather, rinse and repeat as necessary. Avoid contact with eyes. If this happens rinse thoroughly with clean water. For best results follow with Escenti Tea Tree Conditioner.